Jessica Meuse will have her first full-length album, "Halfhearted," released on August 3, 2018 via Warrior Records/eOne. "Halfhearted" is already a Top 10 iTunes Country Pre-Order Album. Penned by Meuse, the 15-song album is a retrospect of her life, loves, and breakups, which is aptly being released to coincide with National Girlfriend Day. Meuse gained national attention on American Idol and became the first person in the history of the hit TV series to perform her own composition in the show’s finals. 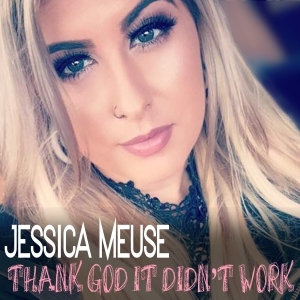 Listen to crowd favorite "Thank God It Didn’t Work," the first single from her album (impacting July 16, 2018), to understand why Meuse’s unique performance and writing style has wowed audiences since the age of 10. "Jess comes to bring it. She is great!" -Harry Connick Jr.
"Thank God It Didn’t Work is easily relatable to folks everywhere who have been faced with challenges in their life and then looked back later grateful that they didn’t work out," noted Meuse. "The song and my album truly embody who I am as a singer, writer, and musician. It’s my best work yet and I hope everyone loves it as much as I loved creating it!" Jessica Meuse dedicates time between recording and touring to raise awareness about Domestic Violence, Cyberbullying, and St. Jude’s Children’s Research Hospital.